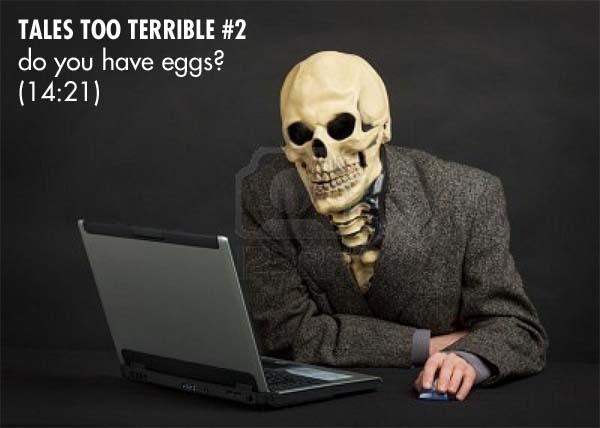 Tales Too Terrible #2: Do You Have Eggs? The second installment of a new dramatic radio project, in which several enthusiasts attempt to communicate their exuberance to a grumpy agent. There is a lot of talk in this installment about eggs. This is the second in a new project called Tales Too Terrible. The first installment can be found here. In this project, mysterious fragments that have been lost or abandoned or disowned by various parties (primarily from a looseleaf notebook that I discovered from Gregory Stetson, who has no address, no phone number, and no email) are resuscitated into radio stories running somewhere between ten and fifteen minutes. If you listen very closely, you may discover certain referential clues to other narratives that you may or may not be familiar with. However, for listeners who aren’t interested in such silliness, the Tales are also designed to be heard in sequential format. There is no set schedule for this project. Whole months may pass by before you get another installment. Or you may get three new installments over the course of the week. The second installment “Do You Have Eggs?” is fourteen minutes and 21 seconds long and can be listened to below.